What is the Validity and Success of the Forthcoming Auctioning of Somalia’s Oil and Gas Assets? The legality, validity, timing, and transparency of the forthcoming proposed auctioning of Somalia’s Oil and Gas assets Is a vexing question that needs sober answers by people in the know of the oil and sector of Somalia. 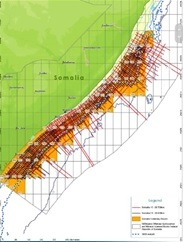 But before I delve into Somalia’s Oil and Gas potential and the risks we face on creating more confusion and questionable ownership structures I would like to inform the readers that Somalia has a huge oil and gas reserves and even explorations done in the 1980s point to wells that did not reach required Total Distance (TD) after finding huge gas caps. I will leave that discussion in another forthcoming article soon. My humble view as to why the forthcoming auction rather than bid round will not yield any success can be summarized in five key points. First, there is no recent viable data that can be relied upon since the latest offshore exploration that was done by Soma Oil and Gas Ltd is suspect and was done in a hurry in two months for an area that is 20,500 square kilometres. Furthermore, the period that the exploration was done was also during high tides that could not yield good offshore seismic results. The other key question to ask is did Spectrum AS do any offshore seismic or did it buy the fudged data that was provided by Soma Oil and Gas – the latter is the case and Spectrum did no exploration at all. Another questionable issue is where the funds of Wintershall Investment Ltd the majority shareholder of Soma Oil and gas came from? Many analysts believe the real money of the Russian tycoon who owns Wintershall came from the UAE and Qatar before they parted ways! Secondly, the legal issue of the many companies that declared ‘Force-Majeure’ is still holding considering the lack of security on the ground in South Somalia that is still under the quasi-control of Alshabaab. In the late 1980’s many multinational corporations like, Exxon Mobile, Conoco, Chevron, Amoco (now BP), Gulfstream(Now Anadarko,), OS Neste, Lundin, Talisman, Amsas, Pecten Somalia Ltd.(Shell) and many others declared ‘Force-Majeure’ according to Wood Mackenzie a Global Energy firm that tracks block ownerships. Thirdly, there is no agreed constitution that has been agreed upon in Somalia and the Federal Government in Mogadishu does not have valid ‘defacto’ and ‘dejeure’ powers over the whole of Somalia. The Provisional Constitution that was agreed upon in 2012 is not yet complete and no referendum was done on it too. Fourthly, though the proposed fiscal terms might be reasonable the issue of signature Bonus of $2Million will surely scare away many companies considering that block sizes are considered to being too small and is only 5000 square kilometres for a frontier unexplored region like Somalia. In comparison Kenya’s Block sizes are much larger than that of Somalia and Signature Bonuses is only $1Million and the Kenyan Government is considering repealing it in line with the 2015 Proposed Petroleum Law. In 2005 the Nigerian bidding rounds that was done in a rush and without taking into consideration blocks under ‘force-majeure’ resulted in Shell Nigerian limited at suing the Nigerian Government for breach of contract that is still ongoing upto today at international courts. Furthermore, currently global oil and gas prices are at a low of around $50 per barrel which is a factor that might also influence the auction of Somalia’s Oil and Gas assets. Finally, the two States of Puntland and Somaliland both have their own laws in regards to the upstream sector and neither of them recognizes the Petroleum and Fiscal laws of the un-transparent, popularly unelected quasi-transitional Government in Mogadishu. The Auction result will surely be a disappointment and no company with good governance will put up their hands for the forthcoming auction which will surely result in undervaluation of Somalia’s Oil and Gas assets.